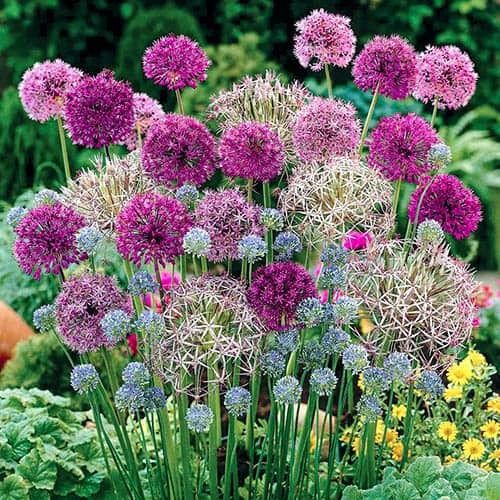 A wonderful selection of 100 outstanding Allium bulbs, these are sure to create an explosion of colour and provide spectacular displays for your garden, patio or decking. The mix of varieties is ideal for the amateur gardener as they are very tough and hardy, making them extremely easy to look after. This collection will also provide ideal cut flowers sure to brighten up your home. 5 Allium nigrum - With their white, globe-shaped flower heads sitting above broad, ornamental, blue-green leaves these wonderful alliums will look simply stunning in wherever you plant them in your garden. 7 Allium christophii - Giant lilac almost solid spheres of flowers stand majestically on long stems above deep green leaves each spring. 7 Allium 'Purple Sensation' - with its enormous bright purple spherical flower heads stand tall on thin stems above deep-green leaves. Related to onions (but dont eat them!) they are very tough and hardy and they are great for beginners. 6 Nectaroscordum siculum - An unusual relation to the allium family, Nectaroscordum Siculum can produce up to 30 hanging flowers from each bulb. 25 Allium 'Drumsticks' - delicate, small purple tinged flowers on long, tall straight stems. Plant en masse for maximum effect in pots or garden. 25 Allium moly - a yellow sparkler of a flower head, a more wild and natural looking small variety for front of borders. 25 Allium neopolitanum - lovely white smaller sparkler flowers, sometimes tinged blush pink in cool, plant together for maximum effect. Supplied as a pack of 100 bulbs, as listed., plant in Autumn or early Winter.